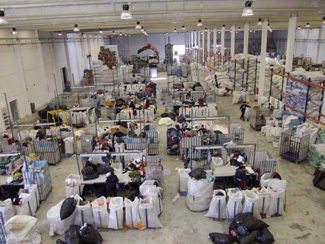 Since 2013 Humana has a new sorting center in Valderrubio, near Granada. These modern facilities of 8,000 square meters, which employs over thirty people. Last year, this team ranked 3,100 tons of used clothing and shoes, mostly from the more than 1,000 containers in Andalusia. 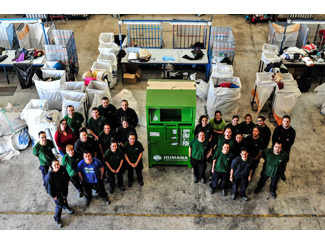 Humana is present in Valderrubio since 2000, date of opening of the first sorting center. The new plant has an area dedicated to offices and four major areas for receiving, sorting, baling and storage of textiles, as a preliminary step for shipment to final destination. 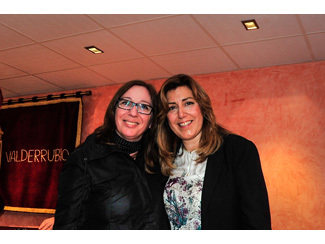 On 6 February, Susana Díaz, president of the Junta de Andalucía, attended the official instrument of the City of Valderrubio, number 772 of 169 Andalusia and of the province of Granada, as part of his visit to the town. The Board approved last November by the creation of the municipality of the term segregation of Pinos Puente, after nearly 12 years of self-government constituted as the Local Autonomous Entity. A representation of Humana team, headed by Consuelo Ureña, person in charge of the Foundation sorting center in the town (on the picture, next to Susana Diaz), attended the ceremony. Humana is the largest organization in the town and this importance. Andalusia remains a firm commitment and great value for Humana. Humana has two second hand hops in Granada, and two more Seville, a network of containers and boxes distributed throughout Andalusia.